William II (Rufus) was third son of William I, the Conquerer. William was born in Normandy around the year 1060. He was educated by Lanfranc who later became the archbishop of Canterbury. William appears to have been his father’s favourite and upon his father’s death, he set sail for England and took possession of the royal treasury at Winchester. On September 26th, 1087, William II was crowned King of England by Lanfranc at Westminster Abbey. In 1088, on year after William II succeeded to the throne of England, a rebelion in favour of his elder brother Robert, Duke of Normandy, broke out led by the ambitious Bishop Odo who was joined by several Norman nobles. By promising reform, William was able to gain the assistance of his English and the rebelion was supressed. 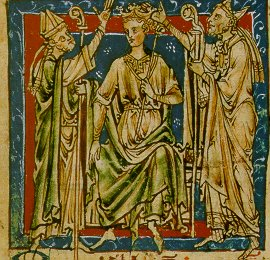 However, in 1090, William declared war on Robert in Normandy but this dispute was finally settled with a treaty. William also declared war on Scotland. However, this dispute was settled with Malcolm, King of Scotland, agreeing to submit to William. Nevertheless, this treaty did not hold and the war was later renewed resulting in the death of Malcolm at the battle of Alnwick in 1093. William was not a man of his word. His reign was filled with disputes and bloodshed. It was in 1096 when he acquired the duchy of Normandy for a large sum of money when Robert departed to join the first crusade. William completed the Tower of London originally begun by his father in 1080. He also began construction of the first Westminster Hall as well as a bridge over the Thames. William was shot while hunting on August 2nd, 1100. To this day, it is not known whether William was killed by accident or assassination. He was buried in the cathedral of Winchester. He was succeeded by his younger brother Henry.